"Then Solomon assembled to Jerusalem the elders of Israel and all the heads of the tribes, the leaders of the fathers' households of the sons of Israel, to bring up the Ark of the Covenant of the LORD out of the city of David, which is Zion." This passage makes it clear that the Temple could not have been located in the City of David. In order for the Ark of the Covenant to be placed in the Holy of Holies, it had to be taken out of the City of David and brought up to the Temple. And what was the Ark doing in the City of David? It's where David placed it in a tent when he brought it from Kiriath-jearim to Jerusalem (1 Chronicles 16:1). Study the diagram on below (figure 4). The City of David is the small finger of land at the bottom, from the dotted east-west line to the south. During Solomon's reign, the city started growing north up the Ophel (the slanted rise from the City of David to the Temple Mount). 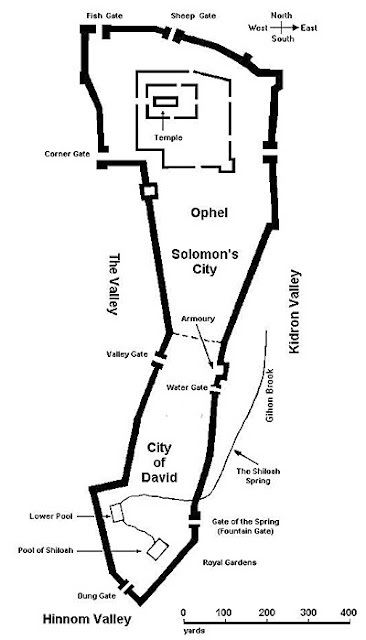 Where the Temple is located on this diagram is Mount Moriah, which today is usually referred to as the Temple Mount. And, again, notice how small the area is. The Temple Mount is 400 yards wide, but when you go south, the walls taper down to a width of less than 200 yards. Returning to Cornuke's basic thesis that the Temples had to be located in the City of David because it is referred to as Zion, it is a thesis that cannot be sustained. Cornuke's second main argument is that the threshing floor which David purchased for the location of the Temple was situated within the City of David (2 Samuel 24:18-25). This is also a bogus argument. In the fourth segment, I'll analyze the third of Robert Cornuke's arguments that the Jewish temples resided in the City of David. 9) Leen Ritmeyer, "Where the Temple Didn’t Stand," World of the Bible News, Summer 2001, volume 3, number 4, page 2. 10) Steve Rudd, "Temple is not located on top of the Gihon Spring," www.bible.ca/archaeology/bible-archaeology-jerusalem-templemount-ophel-gihon-spring.htm, page 1.